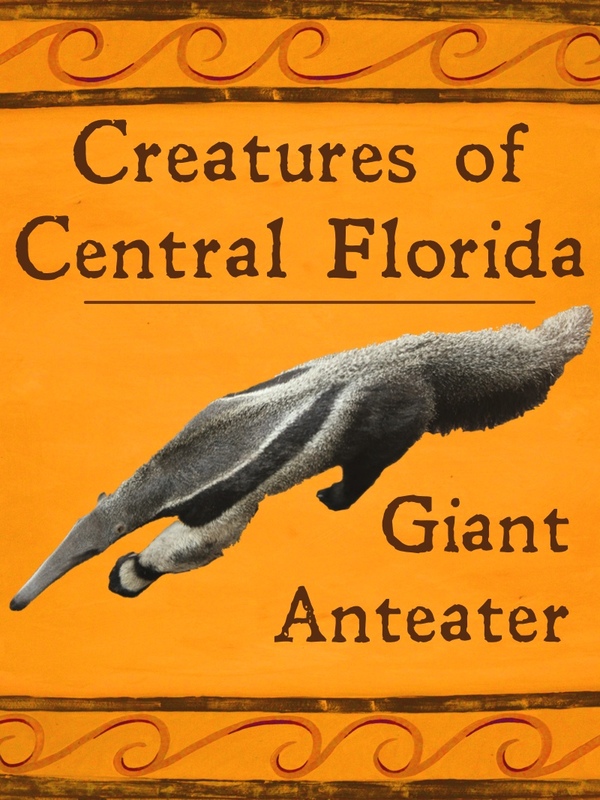 These large, furry creatures are a great example of specialization in nature. When not sleeping up to 15 hours a day, the largest of the anteaters uses its amazing sense of smell to find colonies of insects. 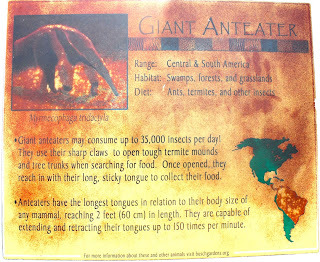 It then uses its extremely sticky, long tongue to eat thousands of termites, ants, and other similar bugs a day. Unlike some of their tree dwelling cousins, the Giant Anteater lives entirely on the ground. 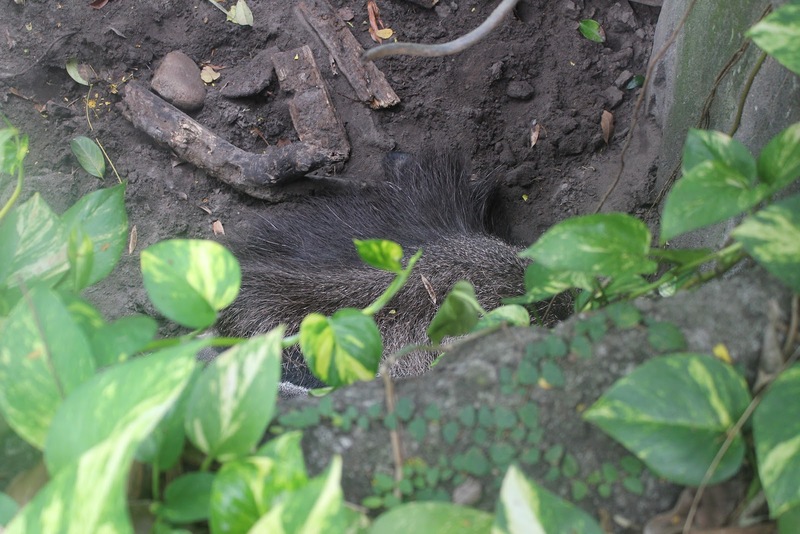 They raise a single baby at a time, with it riding on its mother's back for a year, blending in with her fur pattern to hide from potential predators. 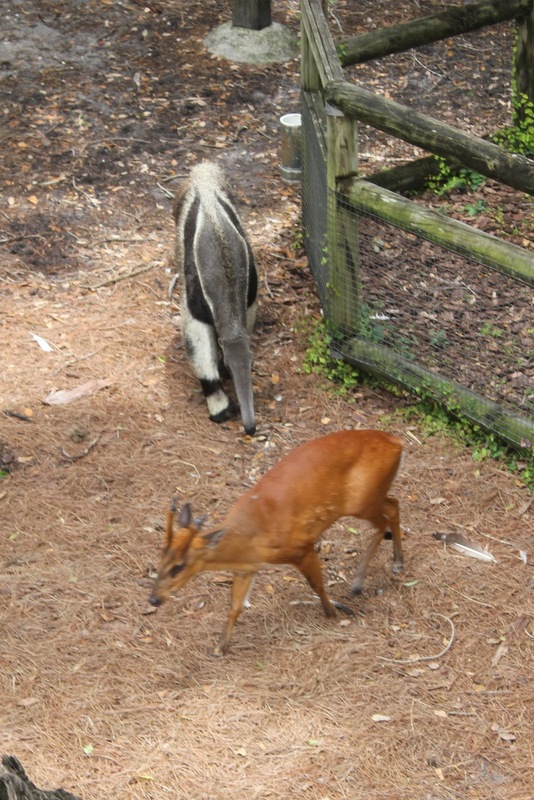 At Busch Gardens Tampa Bay, the Giant Anteater can be found on exhibit in a large enclosure with the Indian Muntjac as well as some native and non-native birds. 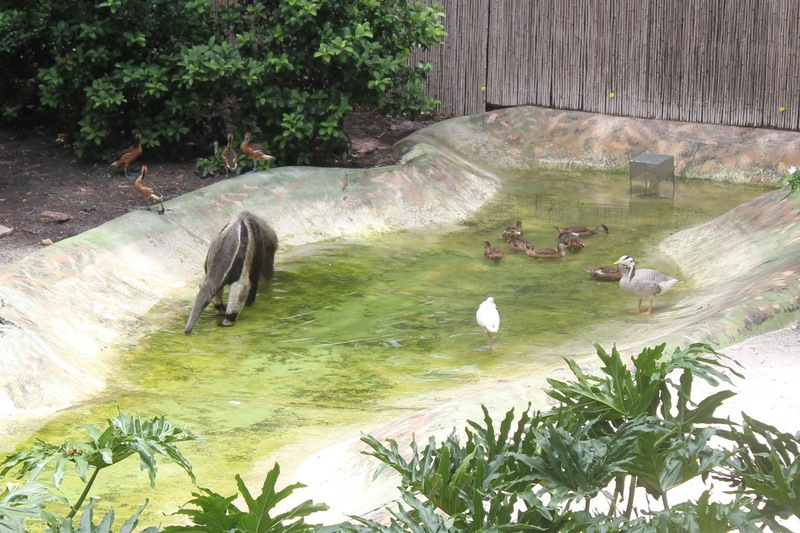 This habitat is located at an isolated spot near the Stanleyville section of the park, and is a great place to see this peculiar creature. 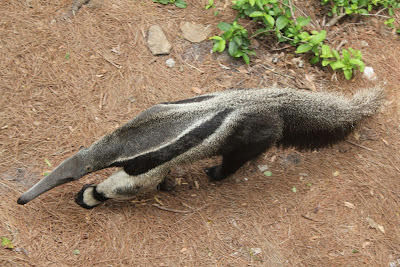 It prefers to sleep during the day when disturbed by humans, but the elevated viewing area keeps people out of sight, allowing the anteater to wander undisturbed. 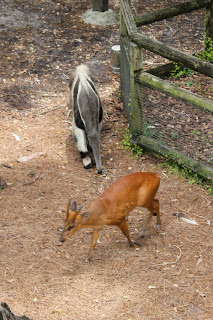 Animal Kingdom also features a beautiful habitat for this creature in its Oasis area. Unfortunately, the anteater here prefers to sleep much of the day, and chooses a secluded pit surrounded by vegetation. It's favorite spot is located in the far right section of the enclosure, but he can be spotted by looking down in front of the guard rail. 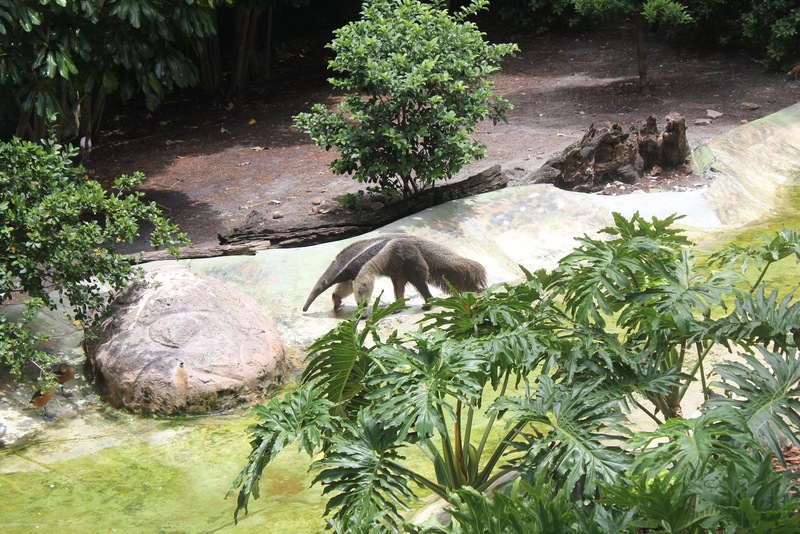 If you're lucky, however, this anteater does become active a few times a day, and you are much closer here than at Busch Gardens. 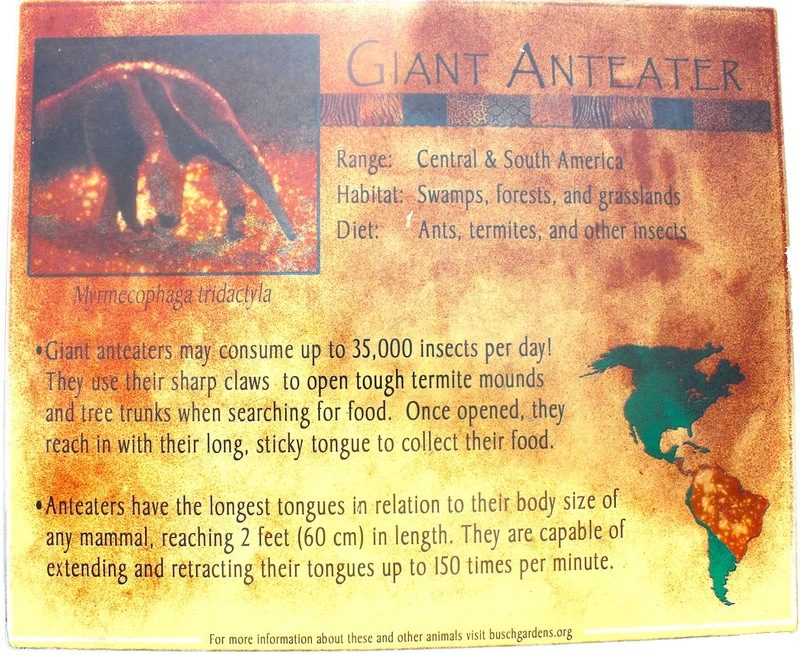 Additional information can be found on Sea World's Animal Bytes entry for Giant Anteaters.